When I first learned to crochet almost ten years ago, one of the fi rst things I discovered was that a whole world of colour had opened up to me. The day after learning how to hook up a granny square my friend took me to a yarn shop and I couldn’t wait to get my hands on all the diff erent shades – it was overwhelming! I instead chose a palette of soft blues and cream, unable to pick from the bright shades, but my appetite for colour soon grew and once I discovered a certain blog written from an attic in Yorkshire I was hooked (pardon the pun) on colour! This issue celebrates colour in all its multi-hued glory, from neon pops to cut through the winter gloom to soft vintage shades to adorn the cosiest bed or armchair. A homage to the artist Josef Albers appears in the form of Helda Panagary’s beautiful blanket, and a gloriously ’70s nod to colour is offset by soft ecru in Fran Morgan’s stunning Canal Barge Jumper, while the warm shades of Jane Czaja’s Sunset Sampler Cushion conjure up images of warmer climes and sunny days. Or, if like me you love a classic granny square, then the Kaleidoscope cardigan by Cassie Ward is a fabulous stashbuster project framed by ever-chic black. This fabulous colour issue is also the last chance to catch up with our brilliant columnist Dedri Uys, whose explorations in colour and stitch have delighted us for two years. 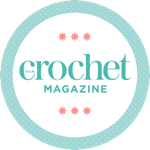 For her final column she reflects on the crochet skills she loves the best and tackles tapestry crochet with a beautifully bright project that’s ideal for colourwork newbies. Next month we welcome a brand new columnist in the shape of Matt Farci, aka A Boy & Bunting, and I’m sure you’ll join me in wishing Dedri all the best in her future creative endeavours! Now go forth and bust that stash – it’s time to celebrate COLOUR!